Co-opting current news and events to add extra punch to your headlines and marketing messages can be a very successful tactic. Borrowing messages let you ‘piggy-back’ on a current media item that has tremendous awareness, doing a lot of the explaining of your message right up front, delivering a reader who is already up to speed on your idea… and ready for your spin on it. However, simply put, there is a risk to being clever. Given the highly polarised political climate that has arisen in the media over the last decade, there is the risk of people both ‘getting’ your cleverness – or disapproving of it. Maybe worse, not even understanding it, and passing over your marketing message as too obscure. One possible strategy in borrowing messages is to avoid interpretations that are framed as criticism – ‘going negative’ – and go straight to celebration. Messages are ideas. Why not celebrate a strong cultural influence by nodding to it – but without an agenda. 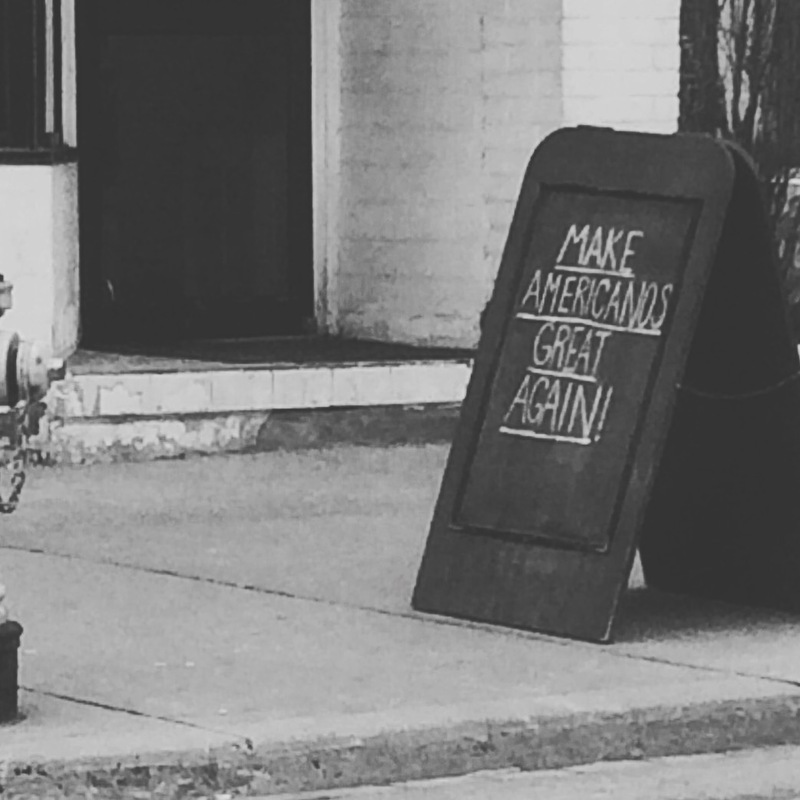 In the above example image, “Make Americanos Great Again” is funny-clever – a turn of phrase by a coffee shop owner, a repurposing to promote, without taking away from the originator of the message. The author doesn’t overwork the parallel by speculating about the origins of his Mexican coffee beans. Always in creative work there exists a risk – ‘too clever by half’. We creatives like to think of that as an endorsement, that we are smarter than our audience. But the phrase itself is booby-trapped; multiply clever by half and … only half-clever. The bedrock of marketing is the audience. If the audience does not appreciate it, it’s not appreciable in its influence. A last tale; some of you may have seem the Shreddies campaign; ‘New Diamond-Shaped Shreddies!’ The joke was, of course, that we all know Shreddies are square, but turn them 45 degrees, and voila! Reinvented! It was a self-aware riff on ‘new and improved’, which is generally accepted as hollow and mostly meaningless, especially in the consumer packaged goods (CPG) industry. And the Shreddies campaign fell flat. Art directors and agency people loved it. Consumers hated it, thinking it criticism of their intelligence. The campaign was withdrawn. Too clever by half.